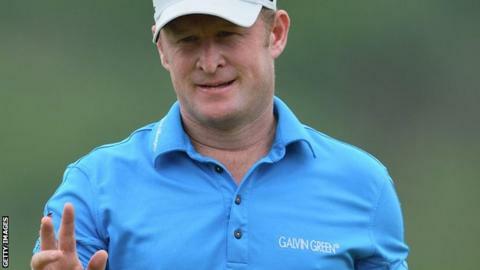 Wales' Jamie Donaldson has a three-shot lead at the halfway stage of the Nedbank Golf Challenge at Sun City. The 38-year-old's second round 66 included seven birdies and a penalty for hitting the ball twice at the 10th on the South African course. "These bizarre things happen and you just have to get on with it," said Donaldson. European number one Henrik Stenson and American Ryan Moore share second place on eight under par. Defending champion Martin Kaymer and Denmark's Thomas Bjorn are a shot further back. Donaldson's only dropped shot of the round came after he negotiated his way through the front nine in just 31. On the par five 10th he hit the lip of a bunker, the ball bounced back and hit the shaft of his club as he followed through, sending the ball back into the sand, resulting in a one-shot penalty. He recovered well however, hitting his fourth shot down the fairway, then firing a superb approach from 150 yards to within a few feet of the pin, before picking up further shots on the 13th and 14th. Donaldson, who won his second European Tour title in Abu Dhabi in January and finished fifth in the 2013 Race to Dubai, is pleased with his recovery on the 10th. "In the end it was a good six," he said. "We had to play six holes of the first round and then back out after a 45-minute break for the second, so it's been a long day. "I've played very nicely for the first two rounds and hit a lot of good shots so I am happy with the way I am playing."